Just as nothing can prevent the sun from rising, just as the palms of the hand can never cover the protruding pregnancy laddened belly, just as light on the mountain is luminous to the city and can never be covered with imaginations of the wicked. As the seasons come at their times in a year, as it shines and no man waves the sunshine, and as it rains and men of vile and men with good heart only but watch. Just as science has not defiled snow from raining down icebergs from centuries to centuries, man has only but continued to count seasons and seasons, expecting the rain to come over and over, man has always been in huge awe over this continuum with nothing defiling their occurrences. Riddles are not but beautiful. We have in all things the duty to adore the greatest inventor of all these irrepressibly beautiful and amazingly interminable natural sequences. Africans have proven too plentiously to be irredeemably stupid and lacking in all sense of critical reasoning, which is the only bane to her development. Why Africans have remained eternally socially, politically, religiously, and economically in a slough or invincible, is a huge matter for a century discussion. However, scientists must convene and decide to embark on a sustained research, that must come up with empirical evidences to the explanation of whether some cells are actually missing in the composition of the brain of an average African sapiens. Because we cannot point to a reason why constructive reasoning seems almost lost among the sapiens inhabiting the geographical space called Africa. One thing is to birth a baby with featuristic evidences of being male, and the other is to exhibit the psychological characteristics. The civilized world is watching to see the eventual fate of Africans on the adventure of political independence and integration. Must everything in Africa be ascribed nascency as a descriptive incubus. The nightmare of the elderly African slavish dictator is ever seeing the youthful African citizens rise to question the trend of events or rise in suspicion of the status quo. The bitter and characteristically octogenarian dictators will rise in usually occasional unison to quickly build conspiracies against the rising reasonable youths. This never go without draconian penalties with impunity and utter disregard to the principles of the existing rule of law. Evidences abound very commonly among Africans. Africans need not only imperial freedom but also freedom from self-induced mental slavery and nonchalance. We have however in this generation, a suitable compensation to mother Africa, a voice of reasoning, a voice that emerged as a consolatory, reformatory, reconciliatory strength. It encourages the mentality of the average dimwitted and retreating African ebony sapiens through accusatory and satirical diplomacy to rise and see through her power of brain and mind and strength. It excites her lost conscience back to the knowledge of her power of eboniness (sic) and environment. It emerged with vigour, revelation, power, truth, humility, love, resilience, sense of purpose, consistency of purpose, prophecy, knowledge and wisdom. This voice has awoken the consciousness of men of valour who are unlike before now bold enough to shoulder the truth and her burden with strength and purpose. It defined life and purpose with new tongue and a new strength. The world is shaken and still in a state of utter amazement. Philosophers are lost in deep obfuscation, theorists are lost for their predictions are defeated. Theologians are swiftly withdrawing their comments which says, "Can something good ever come out from Africa", for the display of fervency, consistency, readiness and fearlessness they have seen rising from the soil from where this voice echoes is historically unprecedented and never foreseen. A new voice of hope has risen from a Prince from the land of the rising sun. That voice that has defeated the most obstinate of all dictators has continued to match on without remorse for whoever is gored by the truth. He is the new symbol and the face of definition for a new Africa. His name is Prince Prophet Mazi Nnamdi Kanu. He commandeers the most valour of all armies, he emerged with a mantra that does more destruction in the courtyard of the wicked and stubborn oppressors than could a thousand army and many weapons of destruction. He studied his people and their oppressors and came up with a solution that has evidently repressed the imaginations of the wicked. With just spoken words, his people have discovered their purpose. Pen and brave words have indeed proven to be more catastrophic than sword and might. His knowledge of history is magnetic, it brings both the elderly, the youths, the children, to the knowledge of power of reasoning. His intelligence has broken the cord of inferiority complex between blacks and whites. The sons of perdition have no choice but to bow and surrender. Without any doubt, Nnamdi Kanu is a prophet of our time. The history of this time will never be complete without his name and what he has done. 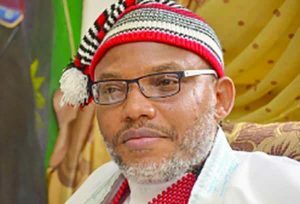 Like great prophets, freedom fighters and civil right icons throughout history such as John the Baptist, Moses, Jesus, Gandhi, Martin Luther King Jr., Mandela and others, Nnamdi Kanu will be in that league. He's a great man and courageous leader. FROM THE BIAFRAN RABBI.SINCE AFRICANS REMAINED BLIND FOR SUCH LENGTHY OF TIME,THE 21ST CENTURY HAD BEEN CHOSEN FOR THEM TO SEE.AGAIN,THEM BLIND ACCORDING TO GOD'S PLAN BUT A TIME TO OPEN THEM EYES IS NOW! ALSO,THE GAME OF BIAFRA IS QUIET AHEAD OF THEM IN BRITISH/HAUSA/FULANI/YORUBAS BUT WE CANT JUST HELP THEM TO CONTINUE EVILS FOR MORE THAN A DAY AFTER 100YEARS NOW. THE GAME IS UP AND ZIONISTS ARE HERE TO BRING AFRICA BACK TO HER DESTINY(GOD).HAHAHAHAHAHAHAHA,WE ARE THERE ALREADY AND SHALL CONTINUE JUST THERE VERY VERY VERY SOON.URS THE BIAFRA RABBI(A RING MEMBER).